NO day-of-ride or on-site registration! In order to maintain the best qualities of BikeFest, have the best one day ride in the state, and allow parking for our participants, we are again limiting the number of registrants for BikeFest to 850 riders. Riders under 18 can ride without accompaniment but must have parent or guardian consent. Riders under 16 must have parent or guardian consent and be accompanied by an adult. Riders under 12 years of age must be accompanied by the parent/guardian and are limited to the 7-mile fun ride. BikeFest fees are NON-REFUNDABLE for any reason including, but not limited to, cancellation due to weather, vender non-performance, or rider withdrawal. The BikeFest directors reserve the right to close or modify the routes as conditions dictate. 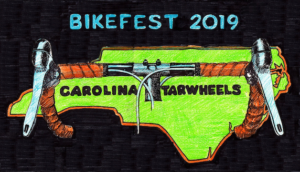 Graphic Arts isn’t really my thing, being a lifelong painter of mostly botanical watercolors, but somehow I have been asked to design the Bikefest tee-shirt many times since my first one in 1998. I do like a challenge, not to mention some extra cash and a bit of notoriety, so these have been fun and rewarding endeavors. 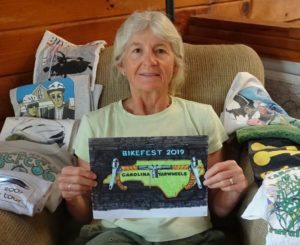 I became a Tarwheel around 1997 and used to look forward to Bikefest as my Long Ride of the Year. I’ve since learned that our ride has become known for its beauty, its food, and its generous donations to worthy causes. I hope some folks out there have a souvenir tee-shirt of mine that brings them good memories.